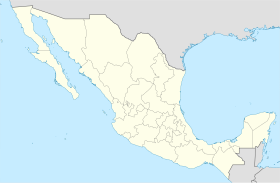 The ceety o San José del Cabo is locatit in Baja California Sur, Mexico an is the seat o the municipality o Los Cabos at the sooth end o the Baja California Peninsulae. In the 2010 census it haed a population o 69,788. Thegether wi neebourin Cabo San Lucas it forms a major tourist destination for travelers, pairticularly frae the Unitit States. The twa ceeties are servit bi Los Cabos Internaitional Airport. The Mission San José del Cabo wis foondit in 1730; the nearbi Río San José wis uiseful tae the Spainyie as a source o fresh watter for galleons travelin tae an frae the Philippines. San José del Cabo is ane o twa places whaur the rare an possibly extinct rice rat Oryzomys peninsulae haes been foond. San José del Cabo, like amaist aw o Baja California, haes an arid climate (Köppen BWh) although it does receive mair rainfaw than maist auries further north due tae tropical cyclones occasionally comin in frae the sooth an bringin vera hivy faws such as 340 millimetres (13.4 in) on the first o September 1998 an 316 millimetres (12.4 in) on 3 November 1993. Oweraw, housomeivver, rainfaw is some o the mist erratic onywhaur in the warld due tae this influence, an mony years pass bi athoot significant faws at aw. Due tae the coastline being entirely exposed tae the Paceefic Ocean, the watter temperatur niver reaches the same heichs as in the state caipital La Paz. The average yearly watter temperatur is aboot 72 °F (22 °C), wi laws o 64-68 °F (18-20 °C) in winter, an heichs o 73-79 °F (23-26 °C) durin the simmer months. ↑ Carleton, M.D. and Arroyo-Cabrales, J. 2009. Review of the Oryzomys couesi complex (Rodentia: Cricetidae: Sigmodontinae) in Western Mexico. Bulletin of the American Museum of Natural History 331:94–127. ↑ "NORMALES CLIMATOLÓGICAS 1971-2000". Servicio Meteorológico National. 2011. Retrieved on December 12, 2011.